First things first, take out the adorbale matching hair bow. Next, try to put my shoes on all by myself. Lorelai is starting to become interested in headwear and accessories. 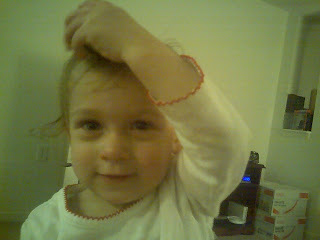 She refuses to leave the house without a hat but also, oddly enough, still refuses to wear any sort of bow in her hair. As soon as I put one in she yanks it right out. 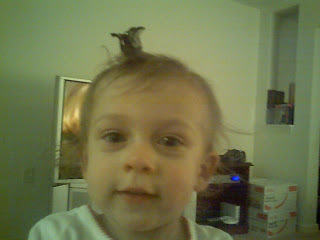 One day she was dying to wear my hair clip. Guess it's that "grass is always greener" theory. As a loving mother, what could I do but oblige my sweet daughter? Of course two seconds later, while wearing a most innocent grin, she ripped it right out. 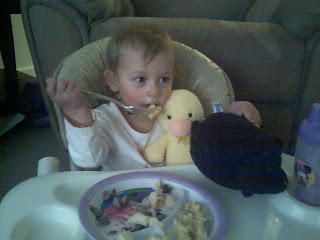 This weekend Lorelai ate some yummy leftovers from Logan's. 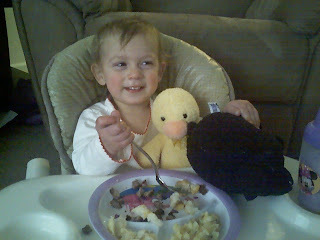 She refused to sit and eat without having her duck and sheep to keep her company. Now there's the smile that makes everything worthwhile. A while back Dan, Jamie, and I took Lorelai and Landon to Monkey Joe's. The kids had a blast and the adults were totally worn out by the end of the day! Dan was especially exhausted as he bore the brunt of the work hauling 2 kiddos around. It's good practice for him since we have our new additon coming soon. :) Jamie and I waited at the bottom of the slides so we could catch little ones and snap pictures. Here's Lorelai taking a ride down on her face. A race to the entrance to see who can be pulled back in by Dan first! What a gentleman! He lets the lady ride while he walks along beside her. A close-up of our inchworm-riding little lady. 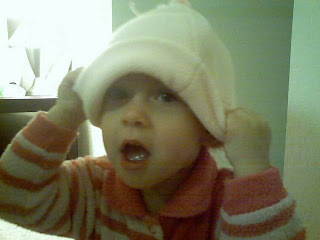 Not too long ago, and by that I mean about 2 months ago, Lorelai refused to keep a hat on. As soon as it hit her head, it nearly simultaneously hit the floor. Now, she basically refuses to leave the house without a hat or hood on her tiny little head. Here is a picture of her trying to dress herself. Please ignore the fact that she's still in her pajamas. With the weather being so cold last week, we had to resort to indoor activities to keep our wild child busy. We decided to play ball. Dan would throw it and she'd race across the room to retrieve it. As is usually the case with our little princess, she brought it back in a most unconventional way. Jamie has all sorts of cute head adornments to accent her photo shoots. We decided to let Lorelai warm these up for Valentine's Day.